Both double glazing and secondary glazing can save energy by reducing the amount of heat lost through windows. The more effective is double glazing, which works by trapping air between two panes of glass, creating an insulating barrier. It cuts heat loss in half and also reduces noise and condensation. Installing double glazing can knock up to £100 a year off heating bills and reduce a household's carbon dioxide emissions by three-quarters of a tonne, but fitting it is a professional job and can be expensive. For those on a budget, secondary glazing could be the answer. It costs less than double-glazing and will still reduce heat loss and draughts, although the savings will be around half of those achieved by double glazing. Secondary glazing works by installing supplementary glazing on the inside of an existing single-glazed window. No planning consent is required and it can provide a solution for listed buildings or homes in conservation areas if replacing existing windows is not a practical option. Secondary glazing shouldn't prevent windows being opened easily for ventilation, but can restrict escape in an emergency, so it may be best to leave one window untreated. In summer, secondary glazing may not be wanted, particularly if it restricts the opening of windows. It can be taken down, but will need to be stored. When fitted, secondary glazing should be draught stripped, but to prevent condensation the original window frame should not be. To get the best from double glazing or secondary glazing, the gap between the two panes of glass should be two centimetres. A smaller gap leads to greater heat loss and a larger one makes little difference to the level of thermal insulation. Using argon gas within sealed units instead of air is another energy saver. Argon is an inert gas, which has better thermal properties than dry air. Other considerations have to be taken into account, such as which type of glass should be used. Low emissivity glass, often called Low-E, is more energy efficient thanks to a microscopically thin coating on one surface of high-quality glass. The clever coating reflects long wavelength heat from radiators and room surfaces back into the building, but allows in short wavelength solar energy, making good use of the sun's heat. Low-E looks identical to ordinary clear glass and the coating is almost invisible. It reduces condensation, so frames and surrounding surfaces need less maintenance, and where extra safety or security is required, Low-E toughened or laminated glass can be used. Double glazing with Low-E glass is as energy efficient as normal triple glazing, without the extra weight, and Low-E can be used in secondary glazing too. A less straightforward question is whether to choose uPVC or timber frames. Wood double glazing can cost up to three times as much as uPVC and there are environmental pros and cons for both. While uPVC windows can be recycles, the reality is that, in Britain, very few are. 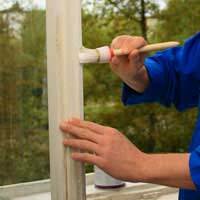 Wooden frames can cause environmental threats too, however, as they need to be painted and at the end of the window's life that paint will end up either in landfill or an incinerator.